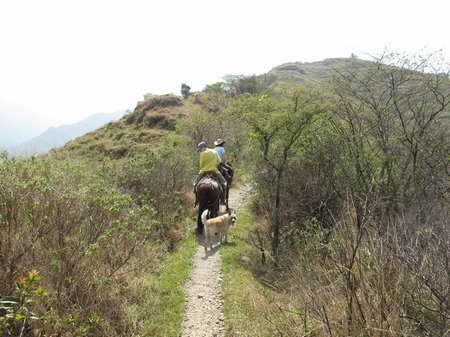 One of the high-lights of our time in Ecuador was the day we spend exploring Podocarpus National Park on horseback. We are not experienced equestrians. My boys did a trek on horseback in Bryce Canyon last year and I did some pony trekking a very long time ago in Scotland. Needless to say we were a little nervous before setting out. 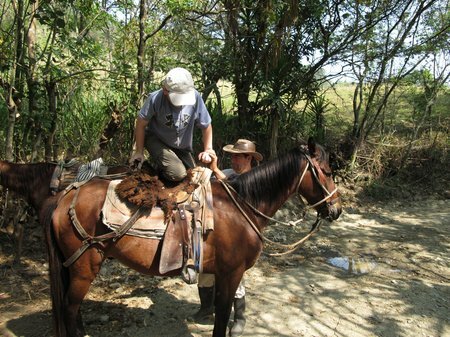 Our guide, from La Tasca Tours – a local company which specializes in horse-riding in Podocarpus – easily settled us onto suitable mounts and we were off! The trail was steep, but the scenery was spectacular. Just days before, rushing to catch buses at busy local bus stations in central Ecuador, my husband had observed that “there are no empty spaces left, people are everywhere”. In Podocarpus we found truly empty, open, beautiful spaces. As we climbed ever higher into the cloud forest, the heat from the valley seemed to follow us. We parked our horses for a “short hike” and a picnic lunch. 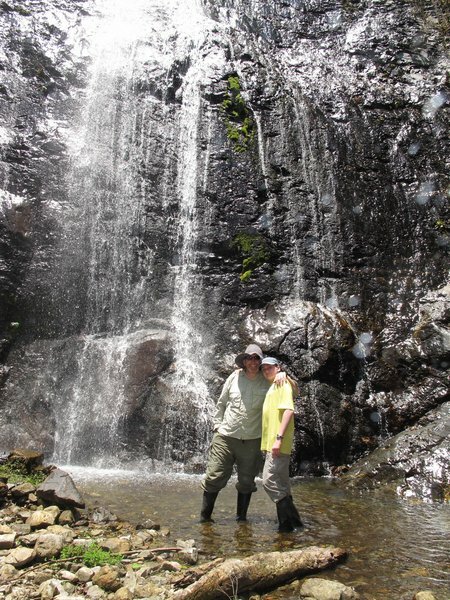 The first surprise, after a dangerously steep downwards hike was this waterfall which gave welcome respite from the heat. 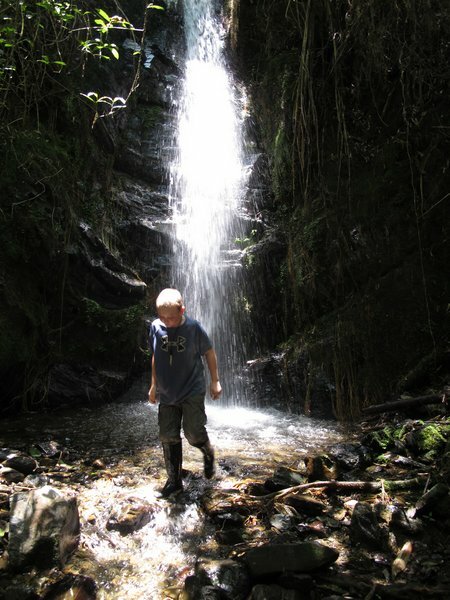 We lunched by yet another crystal clear waterfall and then came the tortuous hike back up to the horses. At times we were dragging ourselves up the steep cliff using tree roots and vines. At the top, we were treated to spectacular views across the mountains, with the cloud forest stretched out below us and the town of Vilcabamba far below. 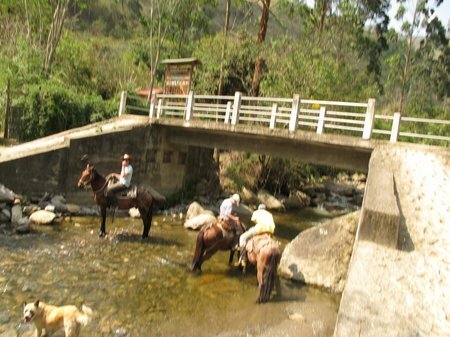 On our return, we paused just at the park entrance to give the horses a rest and let them take a drink of the clear water. I’d be lying if I didn’t admit that Murph and I were very saddle-sore the next day, but it was worth it. 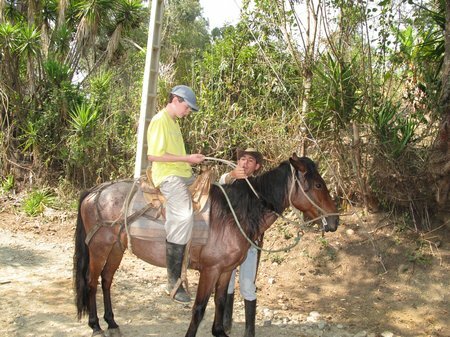 This entry was posted in Kid Travel Photos and tagged Ecuador, Horse-riding, Podocarpus National Park, Vilcabamba on October 7, 2010 by wandermom.